I am fully aware that the last few months have seen the opening of a couple more shops in Austin and the relocation of one of my favorite lunchtime spots. I was going through some photos and found these from December 2017. After we set out for ramen at the local and famous ramen-ya we were put off by the long long lines and decided to go for a drive. We ended up at Hanabi, a mostly sushi type place north of the river in Austin, Texas. It is Korean owned and operated so there is a little peninsular twist to the menu items. I ain’t mad though. Donkotsu sure tastes like tonkotsu to me. Overall I loved my meal here. Flavors were fresh and vibrant, the noodles were outstanding and the broth was heavenly. They even had happy hour pricing! I would 10/10 recommend this place. It is funny that it is located around the back from Phonatic, which once was my favorite noodle shop in Austin, and now is just some noodleshop I used to know…. 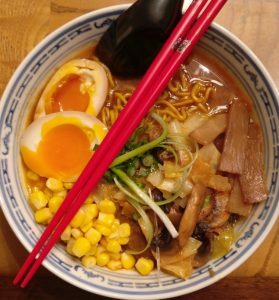 The Happy Hour special – miso ramen. Holy hell this was flavorful. I would recommend this to anyone coming to town. I got the dipping noodles. The broth was stout and flavored heavily. Good noodles and toppings, too! Dipping noodles were cold and chewy. Just how it should be.